OK, I’ll admit it. I still get excited when that first ski magazine of the season arrives in the mailbox. Even though it occurs in the late summer when most people are still planning barbecues, that arrival starts me thinking about winter and skiing. Throughout the autumn months, additional issues of ski magazines build our anticipation for the ski season. They tease us with the latest equipment. They let us dream about exotic ski resorts. They even give us some tips to help us ski better in the upcoming season. When I was younger I devoured each issue over and over. And in fact my career and move to Vermont were influenced by a ski magazine. When I was a senior at the University of New Hampshire I found a recruiting advertisement for IBM Burlington in a ski magazine. In effect it said, “Come work at our Burlington facility, there are 4 major ski areas within an hour’s drive.” That sounded good to me. I signed up for an interview through the University’s placement office and they rest, as they say, is history. Last year I took advantage of the Vermont Ski and Snowboard Museum’s library to look through some old issues and found the ad that helped set my career and skiing paths. By the way the Museum has full sets of issues for both SKI and SKIING magazines as well as others. If you ever want to look up something you may remember from an old issue of a ski magazine, drop by the Museum and try out their library. So when did the first ski magazine appear? Again we had no correct answers to the last trivia question. The oldest ski magazine is the appropriately named SKI magazine. The first issue was published in January 1936. SKI magazine originated in Seattle, Washington so it is not surprising that most of the articles in that first issue dealt with skiing in the Pacific Northwest. There were articles about Tacoma, Leavenworth, and the Wenatchee Valley. Remember this was before any lifts or official ski areas, so the articles described trips and trails available to those willing to climb. Although some Wenatchee skiers were already using airplanes to get them to the top – an early precursor of heli-skiing! There were also articles on “Beginner’s Tips” and the upcoming 1936 Olympics. A couple of excerpts from the “Beginners Tips on Skiing and Clothing” show the differences between skiing then and now. “If falling is unavoidable, select the place if possible, crouch low and fall to rear and side.” Sounds like an ACL injury to me. “Three pairs of woolen socks should be worn to assure the maximum of foot comfort.” Well, there’s probably someone somewhere that still thinks that’s a good idea! Perhaps more interesting than the articles are the 1936 advertisements. 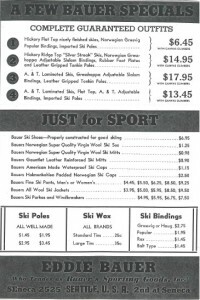 The most recognizable advertiser is Eddie Bauer where you could get laminated skis (state-of-the-art at that time) with bindings and poles for $17.95. Oh, they would also throw in climbing skins. 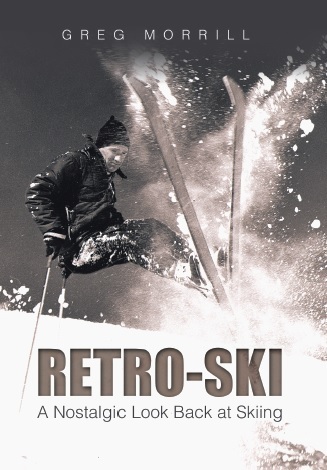 Ski boots were $6.95 and Eddie Bauer parkas ranged from $4.95 – $7.50. SKI magazine is still with us after 77 years. Along the way there has been some competition. 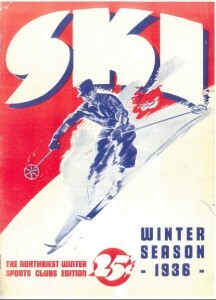 SKIING magazine began in 1948. It went into an online-only mode a couple of years ago, but is now back in print with only 4 issues a year. Powder magazine started in 1972 making this year its 40th. I should also mention Backcountry magazine which began in 1994 and is now published by Jon Howard just over the notch from us in Jeffersonville. Ski magazines are still a vital part of getting psyched for the ski season. I prefer the printed versions of ski magazines even though I generally appreciate our modern technology that makes everything available online. Of course I have a hard time throwing them out so they tend to pile up, but you never know when you might need to look up the rating on those Volkl Shiros!